Click the Flower-looking icon in the main frame. OR, main menubar under Tools you can select Flower Hunter. If you haven't broken your hippy stone yet, it will ask you if you want to do so. You can only attack or be attacked in PvP if you break it. It pops up a new window and defaults to the Attack tab. Click the Search tab instead. 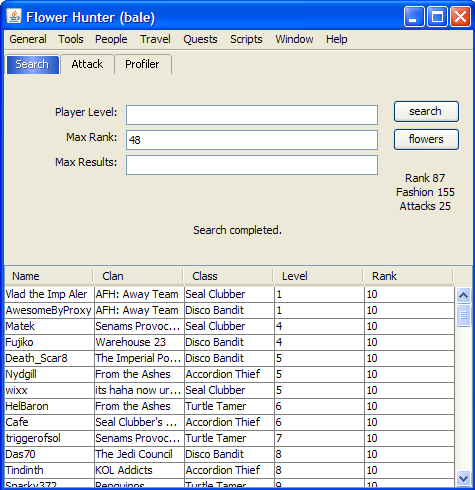 It automatically populates the Max Rank field intelligently. For example, with a 87 Rank, it will set a Max Rank of 48. What this means is that it will look for foes that are at the lower spectrum of what you can attack. Remember, a 87 can only attack as low as a 37. Just 37 though would only show a very limited number of foes. Plus if you won the fight, you'd have to re-search for 38s. Therefore the 37-48 is the default to give you a decent range of opponents to fight. If you want to attack higher ranking foes, you can change that maximum limit. Click Search with the default options. You can see that it finds a bunch of foes below rank 48 for you to pick on, all the way down to rank 37. Select the people you wish to attack. Just don't choose anyone less than 50 ranking lower than your own rank if you changed the lower limit default for some reason. Keep in mind that your rank goes up after every fight (we hope! ), so don't queue up a bunch of rank 37s! Now click the Attack Tab. It will default to using your main stat for Fighting. It defaults to Stealing a Flower. You can pick Rank or Dignity. 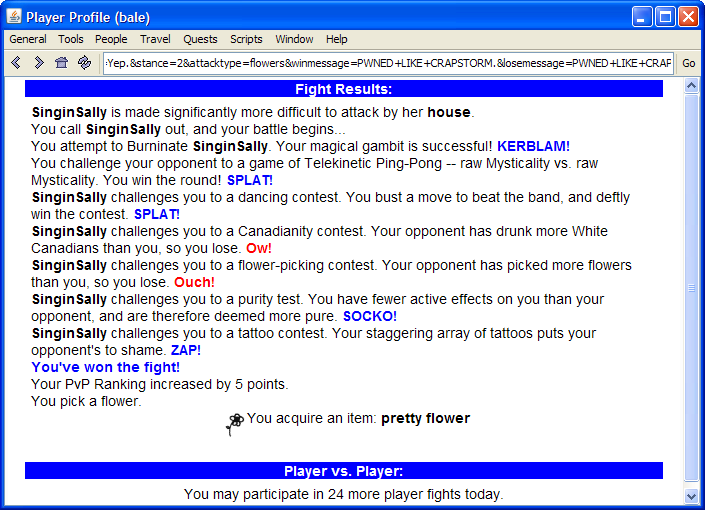 Important note: KoLmafia was apparently written by a bunch of PvP pansies. But, an update was made so that you can now choose to steal items or meat. (subject to ascension rules) Dirty! 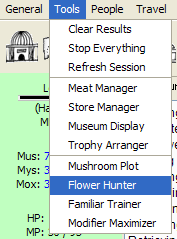 If you want to just pick flowers, you can click the Search tab, click the Flowers button. 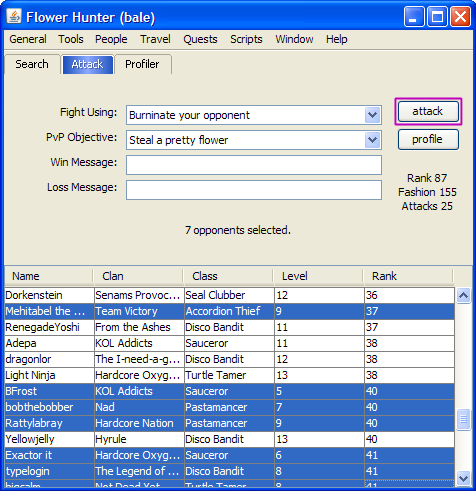 WARNING: It will automatically search for low ranked foes and fight them with all your PvP attacks! It is a quick and easy way to PvP. If you lose, it will find new opponents using your now-lower rank. You can always use the normal PvP interface at your campground and fight like normal. You would only use Mafia to search for victims. The only downside is that you cannot cut&paste the names. Hence you must type them in yourself. However, now that Mafia supports the full PvP capability, there isn't so much reason to do this. BOTTOM LINE: KoLmafia is a huge improvement to the default PvP system, allowing much greater ability to find foes. This page was last edited on 12 July 2010, at 19:53.